Sauvignon Blanc Semillon by Cape Mentelle of Margaret River. The palate is tight and focused complementing the creamy texture derived from wild yeast barrel fermentation and leads to long bright and expressive finish. Wallcliffe is a tiny production wine from a unique parcel of soil in the middle of the Margaret River region. Cape Mentelle enjoy access to some of the Margaret River's most elite vineyard sites, and have long been one of the region's most ardent formulators of classy white wines. Treat Wallcliffe to scallops or sticky belly of pork. The winery is surrounded by landscaped native gardens, in which visitors are welcome to picnic or to just relax and enjoy the busy local birdlife. Private tasting facilities are available for special interest groups at negotiated rates, and light meals can be catered on request. Margaret River is surrounded on three sides by water - Geographe Bay to the north, the Indian Ocean to the west and the cool Southern Ocean to the south. It comprises the rolling hills of the Leeuwin-Naturaliste Ridge, which extends 90km south to north between Capes Leeuwin and Naturaliste and runs only 27km east to west. 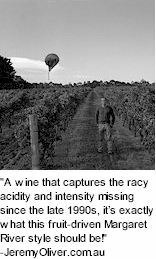 The majority of the vineyards have been established in undulating country surrounding the major water courses that flow west to the Indian Ocean; the Boodjidup Brook, Margaret River and Willyabrup Brook. Most vineyards are within 3 - 7km off the coast at elevations between 150 and 200 metres. The climate is categorised as 'west coast mediterranean', the prime features being mild to wet winters and warm to hot, dry summers. Annual rainfall is 1190mm but the total for the summer months of December, January and February is only 48mm. Heat summation in degree days (C) is 1597 compared to Bordeaux's rating of 1463. The Leeuwin-Naturaliste Ridge rises from an ancient granite landmass 2000 million years old. The ridge, once an island off the mainland, is now joined by a low mineral-rich area known as the 'sunklands'. The soils are mostly formed in situ as a result of long periods of weathering. The maritime location, and the mild temperature of the Leeuwin current flowing along the coast, ensure an absence of both frost and extremes of summer and winter temperatures. Humidity is relatively high, providing an excellent growing environment. In winter and spring, intense southerly low pressure systems can generate gale force winds which, in some years, will damage young vine shoots and flowers. Granite decomposes to form iron-rich clay, which precipitates to the surface forming laterite gravel loams, the best vine growing soils in the region. Due to their great age and constant leaching, these soils are relatively low in organic matter and essential elements and require careful management to sustain good vine vigour.